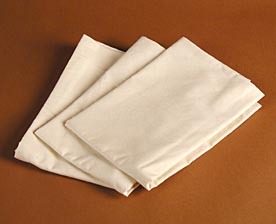 These organic zippered pillow protectors are comfy, classy and healthy. A prized organic pillow cover from Earthsake. When constructing a sleeping environment aimed at your well being, it’s best to be consistent. Cover your Earthsake Natural Bedroom pillows with our 100% organic cotton pillow covers, which are untreated, undyed, formaldehyde-free and—of course—delectably soft. Don’t you and your family deserve the best? Available in all sizes.